Two years since the creation of America’s Automotive Trust, we’ve made remarkable progress in celebrating America’s love affair with the automobile. A day-drive through the Cape Cod of the Midwest. IS IT A CAR, OR TRUCK? This issue’s featured Chevy has a split-personality. Vehicle make and model names and logos are property of their respective owners and their inclusion does not imply sponsorship of or affiliation with Hagerty or any of its products or services. Hagerty Insurance Agency, LLC, provides insurance and determines final risk acceptance. Membership and DriveShare are provided by non-insurance affiliates of The Hagerty Group, LLC. Hagerty, the H Gear Shift Logo, HAGERTY. FOR PEOPLE WHO LOVE CARS, and DRIVESHARE BY HAGERTY are registered or common law trademarks of The Hagerty Group, LLC. ©2018 The Hagerty Group, LLC. HONORING THE PAST. CELEBRATING THE PRESENT. DRIVING THE FUTURE. to countless executives and enthusiasts to promote our message. It has always been received with interest and even surprise — for few if any auto museums have a publication of this quality. Sadly, Walt Tomsic passed away in the summer of 2017 after a struggle with cancer. Deni has retired from OpenRoad, knowing it would never be the same without their joint efforts. Indeed, it was a team effort on their part as they worked long hours together producing each issue. Walt in particular was the consummate “car guy”; organizing events and activities to provide content to the magazine. He wrote numerous articles himself and engaged others as our guest editorialists. OpenRoad became the key work of his official retirement — he loved it and was immensely proud of it. And so it does end. Fitting somehow that Walt, Deni and I step aside in the same issue. I will forever be grateful to them both for their huge contribution to our success through the years. I am pleased to say we have some exciting things coming in 2019, so stay tuned as we roll out our plan forward for OpenRoad and America’s Automotive Trust. James G. May, Owner and President Hopewell Land Partners LLC Haven, Florida our vehicleWinter and for more information. The 2019 Great Race will conclude its 2,300-mile journey at America’s Car Museum on Sunday, June 30! Show off your collector vehicle at the Shine Time Car Show and enter to win an award or come as a spectator and check out the vehicles on display. The Shine Time Car Show is open to all makes and models of collector cars and motorcycles and includes one adult admission to the Museum. Register your collector vehicle at americascarmuseum.org/ShineTime. • ACM MEMBER – $15 Great Race finishes on the Haub Family Field at ACM • EARLY BIRD REGISTRATION – $20 between 1:30 – 3:30pm. (ends April 30, 2019) You won’t want to miss out on hundreds of collector vehicles, food trucks, a beer garden, vendors and more! Managing Editor & Head Writer, William Hall William Hall is an automotive journalist based in Elkhart Lake, Wisconsin, whose work has appeared in Hemmings Motor News, Classic Car Journal, RM Shift and Prancing Horse magazines, among others. His personal collection of cars skews classic Italian, with a few ‘70s era Muscle Cars and a growing collection of vintage motorcycles for good measure. t’s with mixed emotions that I take over the helm as editor of OpenRoad from my friend and mentor Walt Tomsic. Walt and I became fast pals on the first Drive Home, when he and his wife Deni gathered a group of classic car owners to welcome us after a jawclenching, snowy first leg overnighted in Bend, Oregon. Walt continued emailing throughout the remainder of that trip, offering heartfelt encouragement as I wrote daily dispatches from the road for Hemmings Motor News. questions about mobility and the role of the automobile in our society are now being discussed, and AAT is working to have a seat at that table. OpenRoad will be highlighting some of these modern Detroit products which connect to the past in a future column called Retro Rides. As America’s Car Museum rounds out its sixth year, we enter a new stage in the lifespan of the facility. No longer the new kid, the Museum must now stand on its own feet with an expanded mission and outreach under AAT. 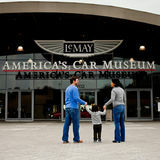 Thanks to its staff, leadership and supporters, ACM remains fresh and exciting – having been named Tacoma’s “Best Destination” in a reader poll conducted by Showcase Magazine, “Best Museum in Western Washington” by KING 5 TV, and included in USA Today’s “Ten great museums worth a pit stop.” As an automotive journalist, I feel that our cars are just a common means to an end; that the real stories are those of the people brought together by them. As our AAT organization and footprint grows, OpenRoad will be as important as ever in keeping us connected. We will try to tell those stories — the stories of the extended AAT family — here in the pages of OpenRoad. Just as Walt would have wanted. Subscription to OpenRoad triannual magazine published by America’s Automotive Trust is a benefit of Silver Key Driver membership and above. America’s Automotive Trust is a 501(c)(3) non-profit organization. A portion of your gift towards membership and sponsorship are tax deductible. Administration: David Lowe Madeira, Vice Chairman — America’s Automotive Trust Paul E. Miller, President & COO — America’s Car Museum | Sr. VP — America’s Automotive Trust Diane Fitzgerald, President — RPM Foundation | VP America’s Automotive Trust | Scot Keller, Curator of Exhibitry — America’s Car Museum | Keith Flickinger, Curator of the Collection — America’s Car Museum Please Address Correspondence to America’s Automotive Trust/OpenRoad, 2702 East D Street, Tacoma, WA 98421 Phone: 253.779.8490 Toll Free: 877.902.8490 Fax: 253.779.8499 Website: americasautomotivetrust.org Please note: Not all of the automobiles depicted in OpenRoad are on display or part of the ACM Collection. Some of the photographs were chosen in order to illustrate or enliven a featured story while others were selected purely for their artistic merit. 1 What happens when you combine the masters of flame, smoke and single malt together on a hot summer night? The answer is Cars & Cigars: Havana Nights, a celebration of cars, cigars and barrel aged beverages. 2 IndyCar racer and RPM Foundation ambassador Lyn St. James test fits student Gracie Hackenberg into a race car at COTA. 3 Only a month after returning to Earth from a 197-day mission aboard the International Space Station, NASA astronaut and RPM Ambassador Drew Feustel (center, in drivers suit) mentored RPM students during Off to The Races at Circuit of the Americas in Austin, Texas. 4 AATâ&#x20AC;&#x2122;s new Director of Institutional Advancement Diane Flis-Schneider at the Concours of America congratulates OpenRoad editor Hall on accepting the award for Best Blog/Column from the Automotive Heritage Awards for The Drive Home II coverage in Hemmings Daily. 5 David Madeira, Joanne Dunham, Rick Small and Tom Hedges present the one-of-a-kind 5L series at Chrome & Glass, the 2018 Wheels & Heels Annual Gala. n the Summer 2016 issue of OpenRoad, I explained how the formation of America’s Automotive Trust – the umbrella entity with members LeMay—America’s Car Museum, the RPM Foundation, Club Auto and the Concours Club – would begin to synergize under this vibrant new organizational structure. To be honest, I had no idea that we would be seeing such positive signs in just two years. Under the AAT banner, we’ve started a movement to preserve America’s automotive heritage with four key pillars of focus within the collector car community. Belong to one or belong to all, with each entity increasing the gravity of the whole. Join from anywhere in the world, knowing you are part of the premier effort of automotive appreciation, preservation, education, mobilization and fraternization not bound to any one building. Seamlessly donate resources to one organization so that it may benefit the multiple entities, or at your direction towards wherever your automotive passion lies. There was no better display of this synergy than from our largest annual media event, The Drive Home. The Drive Home III fielded a representative car from each of the four entities within the Trust. AAT’s increased prominence also attracted outside partners to join in, with vehicles entered from Kettering University (formerly the GM Institute), the Concours d’Elegance of America, the Nicola Bulgari Center for American Automotive Heritage, MFD Classic Motors, the Ace Cafe and Hagerty. These partners were attracted to the strength and mission of the AAT brand, knowing that we could reciprocate in heightened media awareness for their organizations. And we delivered. With 14 public events over 9 days, 1.5 million social media hits, over 146 million total media impressions and coverage from the leading automotive publications, pairing with AAT provided our partners valuable high-level, targeted exposure within the collector car community. Moreover, The Drive Home offered a working blueprint for what the Trust could become in coming years – a broader co-operative that invites in more resources and like-minded, complimentary entities under its umbrella. ion ] AAT’s Drive Home success played directly into an expanded partnership with Quicken Loans to announce the opening of a regional AAT office in Detroit. The office will strengthen our longstanding relationship with the North American International Auto Show, and position the Trust as a partner in future developments to showcase the Motor City’s rich automotive heritage. Following that was the appointment of Diane Flis-Schneider to the position of Director for Institutional Advancement, Mid East-Region. Diane brings decades of automotive marketing and non-profit experience, having most recently served as Executive Director of the Concours d’Elegance of America, one of the premier collector car events in the country. Diane’s boundless enthusiasm and passion for collector cars will serve her well as she engages OEMs, learning institutions and the Detroit car community to carry out AAT’s mission. The momentum culminated at our Wheels & Heels Annual Gala in September, hosted by honorary chairs Dale and Leslie Chihuly. Thanks to our community of donors it was our most successful gala to date, raising just under $650,000 in support of AAT’s ongoing mission to preserve and celebrate America’s love affair with the car, to secure America’s automotive heritage and to promote the continued enjoyment of the driven automobile today. heads-up displays, were easy to use and the cars were fast. Put simply, we had fun. Once again, as in France and other Concours Club trips, BMW had provided us with “the Ultimate Driving Machines”. As we traveled, we visited sites of ancient stones, “croft” villages, castles and battlefields ­‑­­particularly Culloden, where independence was lost to the British. Culloden is sacred ground to the Scots in the manner that Gettysburg is in the U.S., and the Scots remain fiercely proud and independent in spirit. Yet, this was Scotland — and we came to enjoy pub life, traditional music and, of course: Scotch! We visited many taverns and distilleries, large and small, but the Holy Grail was our visit to Balvenie and Glenfiddich — sister companies owned by the William Grant family since the late 1800s. Balvenie generously hosted us for two nights in a beautiful stone house on the property in Speyside where we were the only guests. Each morning a lovely woman would provide a sumptuous breakfast spread and in the evenings on our return a fire was lit in the library where we sat drinking Scotch — Balvenie of course — and talking quietly. Balvenie is one of the few distilleries in Scotland which continues every aspect of the traditional Scotch craft including raising much of its own barley and malting it on site. They even have their own cooperage for barrel repair and construction. The highlight of our Balvenie visit was a private visit with Sir David Stewart, Malt Master of Balvenie for some 50 years. Knighted by the Queen for his contribution to the Scotch industry, David was a humble, gracious host imparting his knowledge to us and answering our questions, no matter how simple they might be. Our time at Balvenie was the highlight of the trip and a vivid example of the kindness we received from the Scots all along the way. The generous hospitality of BMW, Shell UK, Balvenie, barkeeps, cab drivers, guides and locals with whom we struck up conversation in pubs was ever-present. Such experiences — and the opportunity to drive in the company of other enthusiasts — are a great reason to belong to the Concours Club. I look forward to the next trip. Spain or Portugal anyone? SEPTEMBER 14-16, 2018 | HAGERTY FALL CLASSIC TOUR (TROUTDALE, OR) We joined our friends at Hagerty and Classic Car Adventures on a three-day weekend driving event which started on Friday in Troutdale, Oregon, and ended Sunday in The Dalles, Oregon. There were twenty-two vehicles on the tour ranging from a 1948 MGTC Roadster to a 1967 Camaro RS Convertible driven by Club Auto Manager Kristen Wells and Hagerty’s Ashley Shoemaker. This is the same Camaro that McKeel Hagerty’s daughter drove to San Francisco for a story that appeared in Hagerty magazine. Funny moments during the tour: the driver side door jammed and the girls had to either jump in when the top was down or crawl through the passenger side door. DECEMBER 4, 2018 | HOLIDAY HAPPY HOUR AND BULLITT UNVEILING (ACM TACOMA, WA) Club Auto and Concours Club members were invited to an exclusive holiday happy hour and the unveiling of the original BULLITT Mustang. Members enjoyed holiday cocktails and a special “under the hood” tour with owner Sean Kiernan highlighting special features of the hero car from the famous chase scene in the 1968 Steve McQueen movie Bullitt. The original BULLITT is now on display at America’s Car Museum until July 14, 2019. The ‘M’ in our RPM acronym stands for ‘Mentorship,’ which is about identifying, informing, supporting and guiding the individuals and institutions that will carry forward the knowledge and skills needed in the classic car, motorcycle and marine industry. Put in other terms, this is where the RPM Foundation’s vocational opportunity program’s “rubber-meets-the-road.” The RPM Foundation does this through grants to high schools, colleges, post-secondary trade and technical schools offering restoration and preservation curriculum. The word has gotten out; grant applicants for the 2017 fiscal year were nearly triple from two-years prior. These institutions are mentored by RPM’s previewing and sharpening their grant applications for the best-possible success. While some schools may not meet the funding criteria, they stay in the RPM orbit to inform students of restoration career paths, networking and future program development. Lots of activity in the Donovan Motorsports paddock space at Watkins Glen, with Dean Cusano mentoring RPM students from Pennsylvania College of Technology, Alfred State College and Syracuse East Minoa High School, including Andrew Graham (Penn College, foreground) who is changing tires on Lyn St. James’ #61 Jaguar, pre-race because of the changing weather conditions. Shops are mentoring recipients as well, with coaching in written materials such as company profiles and job descriptions. They are included in the RPM Network where they can access possible candidates for shop internships, apprenticeships, entry-level and experienced positions. But ultimately, it’s all about reaching those talented young people interested in the restoration industry who have “heritage in their hearts” and the knowledge and skills to be the stewards of our automotive legacy. RPM mentors motivate youth by providing complimentary programs for students, teachers and parents and introducing them to areas of the industry where their interests and talents might best be used. Master Mechanic Darren Murray at The Klairmont Collection in Chicago, IL with McPherson College, McPherson, KS restoration students Abi Morgan and David Phillips during an RPM Shop Hop. For more information about RPM visit www.rpm.foundation or call toll free 855-537-4579. You can be a part of the movement to secure a future for America’s automotive, motorcycle and marine heritage. To learn how you can be an active participant visit www.rpm.foundation. Intern, Abigayle Morgan, with RPM Ambassador Pat Barnes at a SEMA Town Meeting, a regional gathering of members to gage the current pulse of the industry. MENTORING: Abigayle Morgan RPM met Abigayle Morgan at a car show where she was showing her mini-car. The 22-year old grew up in a family of car enthusiasts. Her dad worked as a diesel mechanic, and mom dabbled in car upholstery in their hometown of Lansing, Illinois. Their weekends consisted of car shows and club drives with their collection of vintage Crosley mini-cars. Collections Renée Crist. “I was living the history of cars as we arranged them for display, and saw a whole other side of the industry,” said Abi. She is now considering a position within a museum or auction house where she can interact directly with fellow car enthusiasts. At the age of 13, her dad gave her a 1950 Crosley Hotshot Roadster, a car she still owns and cherishes. Every October since birth, she and her parents have attended the Newport Antique Auto Hillclimb in Newport, Indiana, with their Crosleys. In 2016, Abi won the Hillclimb event in the Pre-1955 Discontinued Makes class. She thanks the RPM Foundation, and the personal mentorship of President Diane Fitzgerald, for her success. “RPM has definitely gotten me where I am today,” she beamed. “I have had the best summer ever, thanks to the RPM Foundation,” said Abi. “I judged at the best car show in the world. I worked at the best museum in the world. And now I am returning back to the best school in the world.” The RPM Foundation supports restoration and preservation training programs for the next generation of automotive, motorcycle and marine craftsmen and artisans. As the education arm of America’s Automotive Trust, the programs, resources and grants provided by the RPM Foundation safeguard the future of the collector vehicle industry by sustaining hands-on training for young adults. RPM Foundation accelerates the growth of the next generation of Restoration and Preservation craftsmen and artisans through formal training and Mentorship. Abi Morgan, America’s Car Museum Summer Intern (fourth from right) with Renee Crist, Curator of Collections (far right), Dale Wickell, Collections Techician (second from left), and the ACM Collections volunteers on Abi’s last day. o vacationers in the Great Lakes region, Wisconsin’s Door County Peninsula is known as “The Cape Cod of the Midwest”. Studded with historic lighthouses and national parks, apple orchards and wineries, the area is a traditional getaway for city folks looking for respite from the summer heat. The many small villages that dot the coastline offer boutique shopping and restaurants alongside quaint inns and bed-and-breakfasts. Sailing, hiking and fishing remain favorite activities, capped off by a hearty dinner of whitefish at a traditional outdoor fish boil. While ostensibly a summer resort area, the county’s peak tourism occurs in early autumn, when changing leaves make for brilliantly colored vistas against a brilliant blue Lake Michigan. There’s just enough of a chill in the morning air to linger over a cup of hot coffee or cider; and of course, our classic cars just love to run on that cool, moist air on those twisty country roads. For a nice circle tour, start your drive up the west side of the peninsula, using the historic village of Ephraim as a base. Set the tone with a cappuccino at Leroy’s Water Street Coffeehouse and enjoy the jazz music and eclectic décor of this funky log cabin while poring over a road map. Walk about 200 yards towards the village hall, stopping to admire the antique firetrucks at the old fire station. Just behind the picturesque hall is a small bistro named Trixie’s; put your reservation in for an early dinner, as the intimate restaurant seats only sixteen. Driving north on Hwy. 42 will afford a nice overview of other eating and lodging options along the water, including the famous Al Johnson’s Restaurant in Sister Bay. Staffed by Scandinavian exchange students and complete with its own herd of grazing goats atop the building’s grassy roof, it’s a required stop for morning Swedish pancakes with lingonberry sauce. The goats sometimes sleep in, but are usually there by 9 AM. Stay on Hwy. 42 north, headed to Gill’s Rock and the famously curvy road shown on the cover. If time permits, you may want to take the car ferry over to Washington Island through the Death’s Door Passage, the namesake of this maritime county. Meander through back roads in Newport State Park heading southeast. Adventurous types can walk in calf-high (cold!) water on the causeway out to Cana Island lighthouse, or hitch a ride on a tractor-drawn wagon if you want to keep your knickers dry. Being a peninsula, you really can’t get too lost; pick out rural roads heading down the eastern coast with notable stops at Bailey’s Harbor, Cave Point and Whitefish Dunes. Thirsty yet? Stop in at Stone’s Throw Winery at the intersection of highways E & A, just west of Bailey’s Harbor. The sun should be setting soon, and that’s a communal affair in this part of the world. Find a boat, beach chair or barstool with that glorious westward view, and carefully plot your next move – or return visit. outhern California has a history steeped in customizing cars that grew out of the early days of Hot Rodding in the ‘40s & ‘50s. Young men longing for the thrills of speed and individuality began customizing Model T’s & A’s. These cars were plentiful, well-engineered and inexpensive, making them the perfect platform for free expression and identity. avarian Motor Works’ (BMW) reputation for engineering excellence dates to the inception of the company in 1916. Underpinning that notion has been the company’s serious investment and ultimate success in motorsports. The Munich manufacturer persevered over the last 100 years, including the Second World War’s devastation and a deep financial crisis of the 1950s. At each turn, the company tackled challenges, met adversity and built on its core technical strength. It is this story that America’s Car Museum tells in the exhibit Heroes of Bavaria – 75 Years of BMW Motorsports. The world’s fascination with BMW motorcar racing began in earnest in 1936 when a BMW 328 prototype won in its premiere competition outing on the famed Nürburgring. Another milestone in BMW product history was the New Six CS, better known as the E9 in manufacturer product vernacular. This magnificent two-door coupé was built for BMW by the celebrated coachbuilder Karmann from 68 - 75. An equal standout “Hero” in the Heroes of Bavaria exhibit is the “Bill Power” M6 GTLM named in honor of Bill Auberlen, the winningest driver in BMW history with 400 race victories. The emphasis of the early Hot Rodders was on power, performance and making a social statement having to do with ingenuity, creativity and ultimately independence. The Tuners @ ACM exhibit presents a new generation of magnificent automobiles from today’s tuner car community. The exhibition engages museum visitors by detailing the superb creativity and technical competence of the builders of these uniquely individual vehicles. The Tuners story begins with the arrival of well-engineered front and rear wheel drive cars from Honda, Toyota, Datsun (Nissan) and Mazda in the ‘70s and ‘80s, which naturally led to the creation of a new category of automotive customization, much as the Ford Model T’s & A’s did in the post-war period. The Tuners exhibit at America’s Car Museum illustrates how the these early imports, primarily from Japan, took hold in California and ignited a new genre of performance cars built around technology, speed and creativity. It equally reveals the culture surrounding the vehicles, and the transformation of the Import Tuner Car phenomenon celebrated in music, fashion and popular films like the Fast & The Furious movie franchise. Today, “Tuner Cars” are as much a part of the American automotive vernacular as the import brands that captured the hearts and minds of consumers across the country. These are only three of eighteen examples of what visitors will experience in the Heroes of Bavaria exhibit. You could fill a book with the history of BMW Motorsports and these cars. In fact, there is one that was created just for the Heroes of Bavaria exhibit. It is available in the ACM Store, or we can ship you one. Just call the Museum and ask for the Store and they will set you up. Better yet, experience it in person! CAR,OR is it a TRUCK? The GMC division wanted a piece of the action, so in 1971 the GMC Sprint was born. Essentially a rebadged El Camino, it allowed the GMC dealerships to add an entry-level truck to their showroom floors. Now GM could have it both ways, with a performance car and a light truck cast from the same die. The Sprint would later be re-named the GMC Caballero, staying consistent with the Spanish theme. By 1972, GM’s marketing department began to de-emphasize performance in the face of rising insurance regulations, fuel costs and safety concerns. Horsepower ratings would now publicly be stated in a net format instead of gross, giving the appearance that the performance cars had suddenly been eviscerated. ACM’s 1972 El Camino used in The Drive Home III features the middle-of-the-road spec 350/2 bbl. small-block engine rated at a meager 175 horsepower. By the previous gross rating system it would be closer to 210 horsepower. Still a far cry from the 1970 LS-6 equipped version which boasted 450 horsepower, and was conservatively rated at that. 1972 proved the most popular production year-to-date for the El Camino, topping out at over 57,000 units produced. Spotters can identify the ’72 model by the single headlights and combined parking and side-marker light fixture. The high-performance ‘SS’ package was still carried over from earlier years, and air shocks in the rear helped accommodate payloads. The El Camino continued on in the Chevrolet lineup with restyles in 1973 and 1978, soldiering on until 1987 before it was eliminated, giving rise to the trend of light pickup trucks and sport-utility vehicles. Although many automakers have tried, there have been very few vehicles that fill the niche that the El Camino did. It remains a uniquely American vehicle, born out of a need for utility that has endeared many for its stylish charms and faithful service. Length: 207 in. Height : 56 in. Width: 75.75 in. Wheelbase: 116 in Curb Weight: 3,328 – 3,454 lbs. *Specification data can, and often does, vary from source to source. When in doubt, we use those specs most often cited. to the mix, but as you think about it more, we hope you see the connection to estate planning. With estate planning you “Honor the Past” by utilizing your lifelong, hard-earned resources for the betterment of someone or something else. You have the opportunity to “Celebrate the Present” with creative gift planning options affording you the ability to enjoy the gifts while you’re still alive. And, you can truly “Drive the Future” by creating a legacy and impacting programs that can have an impact for generations to come. You can achieve all three feats by going through a small amount of introspection and determining how you want to make that ultimate impact today. To that end, we ask you — How have you Honored the Past, Celebrated the Present and Driven the Future as it pertains to your passions? Give it some thought. Times change, people change, companies change but our passion for “securing America’s automotive heritage” will drive on. We know you share our passion for automobiles and we’d welcome your support in securing that mission for generations to come. Until next time, take care and thank you! For more Planned Giving information visit americasautomotivetrust.giftplans.org. Museum visits. By bringing the Powering the Future content into the classroom we can more fully discuss the implications of the materials presented to encourage a deeper understanding of the information. Through interaction with the information present in both the learning lab at the Museum and the outreach into the community we aim to empower our students to embrace their curiosities, further their quest for knowledge and have the skills and confidence to join the STEM field and be the future of the automotive world. We continue to work with a variety of partners to make this new, interactive learning lab have lasting impact by equipping all ages with basic energy literacy and a better understanding of the scientific and technological thinking transforming our mobility. ACM’s Powering the Future Learning Lab provides students with a fun and engaging environment that serves as a hub for STEM learning. Through Museum visitation, programs and teacher trainings, our goal is to drive innovation full STEAM ahead! Our efforts to spark student interest in science, technology, engineering, and mathematics (STEM) are only possible through the generous support of our title sponsors The M.J. Murdock Charitable Trust and Puget Sound Energy, and presenting sponsors the Bamford Family Foundation, the Ben B. Cheney Foundation, the Ellison Foundation and the National Renewable Energy Laboratory for bringing Powering the Future to life. We are also excited to announce Boeing’s support for the upcoming Fueling STEM Innovation Project. IN DETROIT Mobility & accessibility are critical to building a stronger, more inclusive Detroit. Find out more about how weâ&#x20AC;&#x2122;re partnering with organizations that are driving innovation in our community at QuickenLoans.org. coast-to-coast mission of preservation, education and celebration. THIS IS NOT A CAR Stop treating your truck like a car. Give your engine extreme wear protection for serious hauling, heavy lifting, dusty roads, intense heat and cold, and rugged terrain. You know, your preferred conditions. Introducing Shell Rotella® Gas Truck Full Synthetic Motor Oil. From the makers of the #1 diesel engine oil brand in North America. * Now for gas trucks. DISCOVER MORE AT ROTELLA.COM/GASTRUCK Not for use in diesel engines. *Based on Kline report 2017. © SOPUS Products 2018. All rights reserved. Find it at a retailer near you. THE NUMBER FOLLOWING THE NAMES INDICATES THE YEARS OF CONSECUTIVE GIVING. WE MAKE EVERY EFFORT TO ENSURE THE ACCURACY OF MILESTONES. HOWEVER, IF OUR RECORDS DO NOT MATCH YOURS, PLEASE CONTACT US. 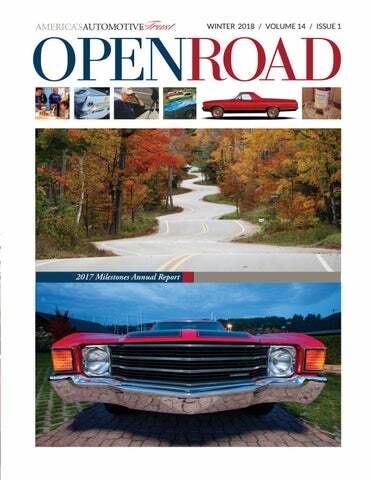 Digital edition of America's Automotive Trust's award-winning magazine OpenRoad and 2017 Milestones Annual Report.